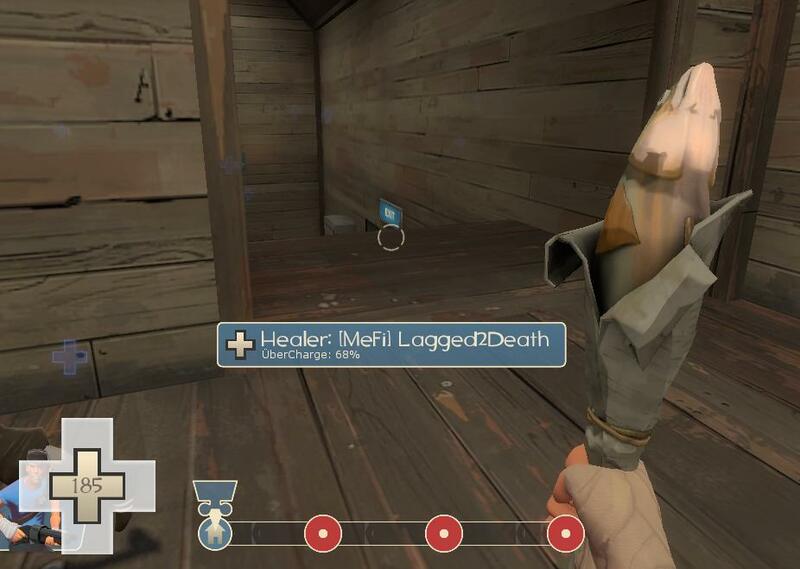 Say what you will about the latest TF2 update, and many have, but it contains the most fun weapon yet– the Holy Mackerel. It’s just pure fun. It’s animated really well, for one thing; it flops around in a goofy way, and glistens like a wet dead fish. Every time you hit someone with it there’s a notice in the upper right, and if you kill someone it says FISH KILL! I’m a lousy scout, but it’s a blast to run around on Blu with the fish, and I’ve actually done pretty well in some rounds, a combination of captures and FISH KILLs. I learned fairly quickly that if you’re some distance away you’d better use, you know, a gun; also that the fish, awesome as it is, does not do well against fire or miniguns. But it doesn’t matter, because, come on, FISH KILL. Coming soon from Valve, when some tricky negotiating points are resolved, such as them not even being aware of who I am. Click to enlarge. The first few times TF2 invited me to save deathcam shots, it seemed kind of mean– I already knew I sucked, I didn’t need reminders. But I have to admit that it sometimes comes up with pretty cool images. Click the thumbnails to enlarge. Quite lovely character animation for machinima. You gotta feel for that demoman. Also the opportunity to learn two useful French terms: bêtisier “gag reel”, and gogol “tard”.